July 28-29: I'm combining these two days since I took two consecutive zero days here and don't really have much to write about. 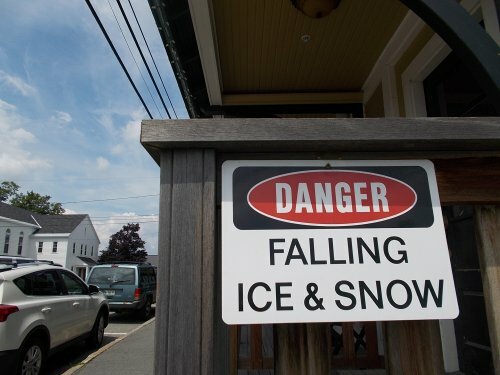 =) I walked into downtown Rangeley both days. Mostly to enjoy the town and see the sights. The two things I had to do was head to the grocery store to resupply--where I'd purpose food that should pretty much get me all the way to the end of the trail! I was going to stop in one more trail town ahead, but Monson had no real grocery stores so I purchased most of what I'd want here and have it shipped to me in Monson. I bought a lot food! Basically two weeks worth! 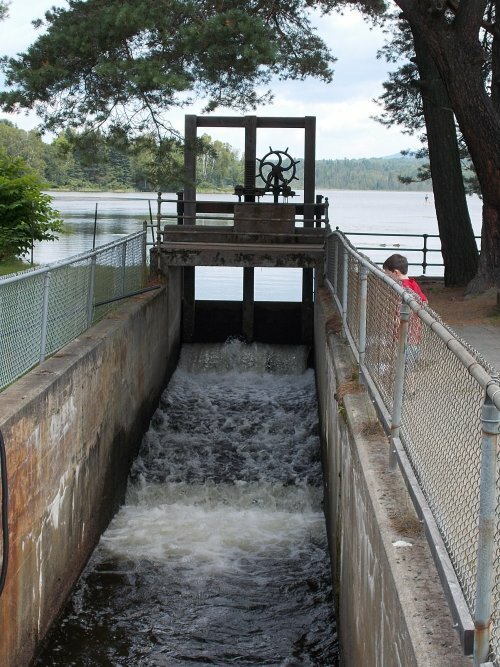 The town of Rangeley is located on the shores of Rangeley Lake, perhaps the only body of water in the entire state that they actually call a "lake" and not a "pond"! 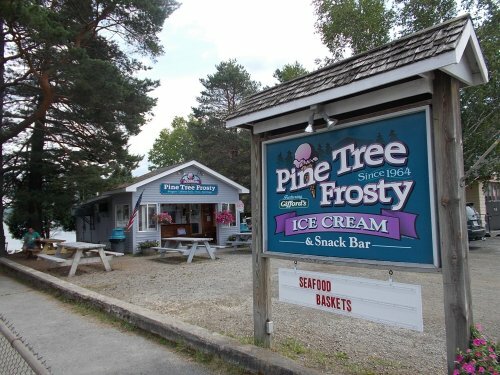 Both days, I stopped to get ice cream at Pine Tree Frosty and I hung out behind the store enjoying the view over the lake behind it. 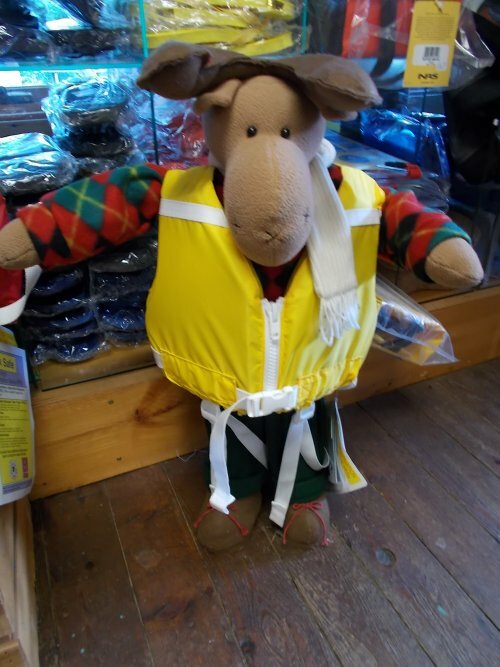 Rangeley is a wonderful little tourist town! I have a fond memory of eating the best slice of apple pie here back during my 2003 thru-hike. In fact, I consider it the best food that has ever entered my mouth. I'm sure it was just your typical run-of-the-mill apple pie, but after walking here from Georgia, everything tastes better. I joked with the other hikers that the real reason I was hiking the trail a second time was so I could have this slice of apple pie again. I could never have it unless I had walked 2,000 miles to get there! I couldn't remember the name of the restaurant, but I had a vague memory of what the exterior looked like and hoped I'd stumble into it during my walks, but if it's still around, I never found it. It has been 12 years, though--maybe they went out of business? 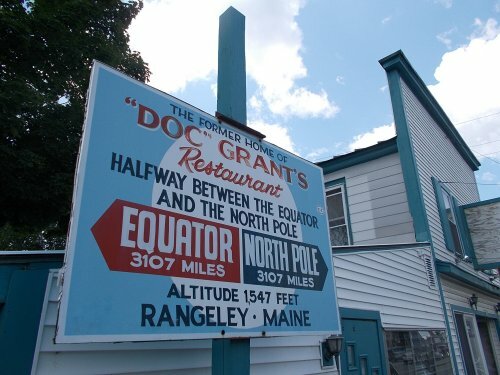 Little known fact: Rangeley is located on the 45th parallel, halfway between the equator and the north pole. Finally! I was getting pretty tired of being so close to the equator! When I returned after my first afternoon out, I had learned that my stuff had been moved to a new bed! A large party had reserved the entire room where I had been set up, and since I was gone, they moved me and all of my gear to another location. Stacey--the owner of the establishment--seemed concerned that I'd be upset that I was moved unexpectedly. 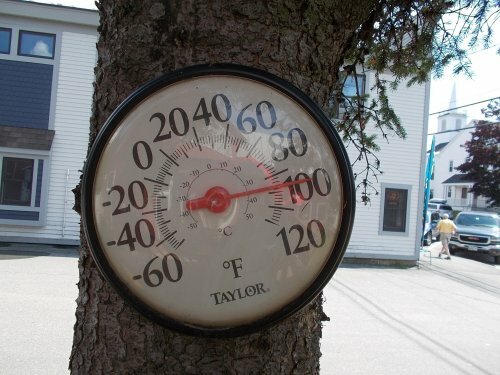 I didn't mind in the least, and as it turned out, the new location was a lot cooler (I had been on an upper level where heat seemed to collect and it got rather warm! ), had a larger bed to spread out my gear and lots of shelves nearby to throw even more gear. It was an upgrade as far as I was concerned! Most of my day was spent writing blog posts. I also had an order from Amazon.com sent here, which included a guidebook for the GR 20 through Corsica. My AT hike was nearing an end and it seemed like as good as time as any to start getting "real" about planning the European adventures that would follow. Even booked my plane tickets to and from Corsica. The couple running the hostel--Shane and Stacey--were absolutely wonderful. Stacey was the main face of the operation. Shane seemed to do more of the shuttling--but I Stacey was the one I saw running around giving the "grand tour" of the hostel to arriving hikers, cooking breakfast and I interacted with more. I overheard Shane telling a story to some of the other hikers during my first zero day here, but another guy up the trail who'd been running a hostel for a couple of decades now and that perhaps he'd been doing it too long because when he went to visit, he heard the guy yelling at the other hikes to "get in the f***ing car!" Clearly upset and impatient with the thru-hikers so seemed to ignore him. "When I get to that point, I'm getting out of the business," he told everyone. The next morning, he was about to shuttle some hikers back to the trail and went around to all of the rooms to say that the shuttle would be leaving in five minutes. One hiker, who just woke up frantically tried to throw all his stuff together in time to catch the shuttle and I said to Shane, "Come on... say it. You know you want to...."
He looked at me puzzled, not sure what I was taking about. "You know," I said, lingering a bit to see if he'd figure it out. He still looked perplexed. "Get in the f***ing car!" I said. He laughed. "Nooo..... I'm not saying that. I'm not that jaded! Not yet, at least!" 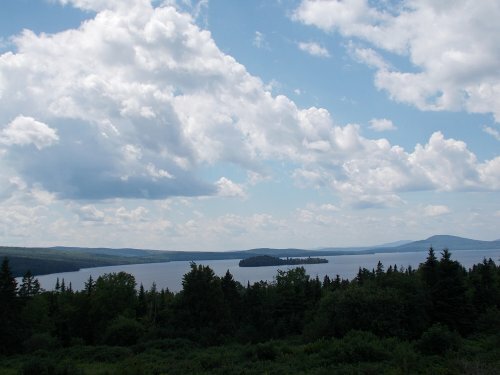 Anyhow, I had an absolutely wonderful two days in Rangeley. I think I could enjoy living in a town like that..... but that's about all I have to write about the town. 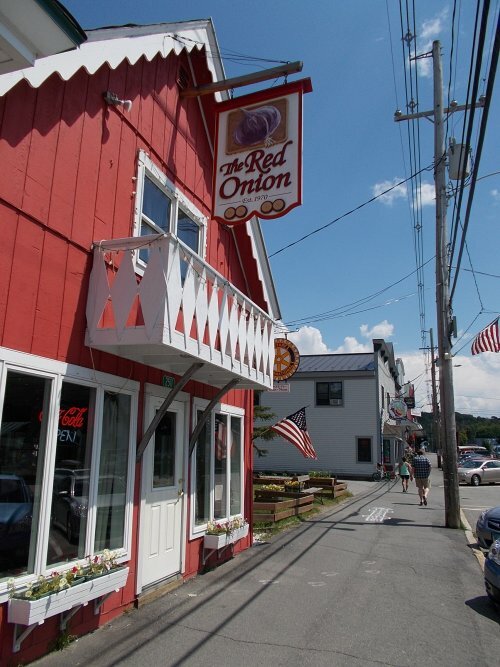 For lunch one day, I ate at the Red Onion. Yum! 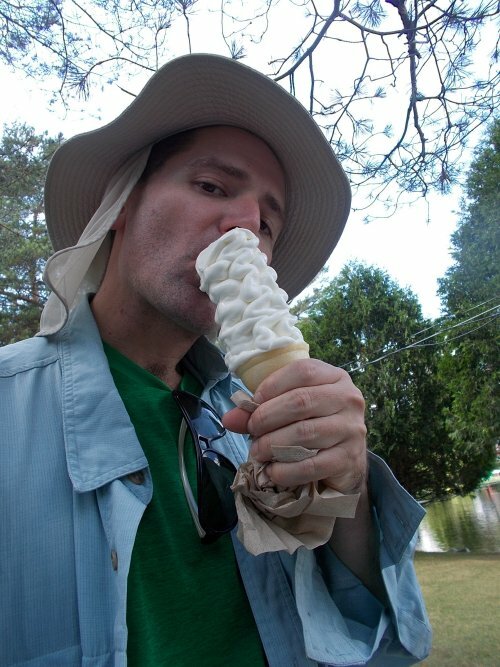 In any case, it's certainly warm enough for a frosty ice cream! Oh, yeah... that's what I'm talking about!